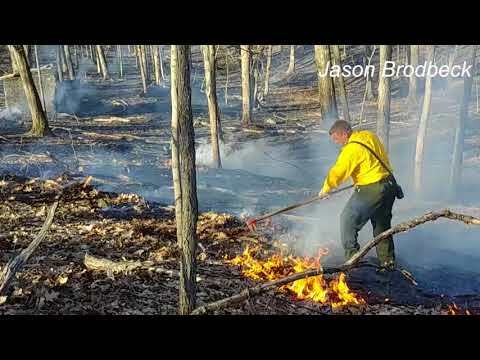 One firefighter was slightly injured and more than 30 firefighters battled a brush fire that burned more than 20 acres near Van Wagner Road in the Town of Poughkeepsie, according to Arlington Fire Chief Tory Gallante. Arlington firefighters responded to the fire around 5 p.m. Saturday for a report of black smoke from the woods behind the home at 342 Van Wagner Road, Gallante said. The first fire department unit arrived on the scene within five minutes of the initial call and found about 10 acres on fire, which with the wind, grew to about 15 to 20 acres. To help access the difficult terrain, firefighters from several departments used off-road utility vehicles to help battle the blaze, Gallante said. Gallante said it took all about two hours to put out the fire. One firefighter received a minor eye injury and received medical treatment. Assisting at the scene included Pleasant Valley, LaGrange and Roosevelt fire districts, as well as the Dutchess County Department of Emergency Response.